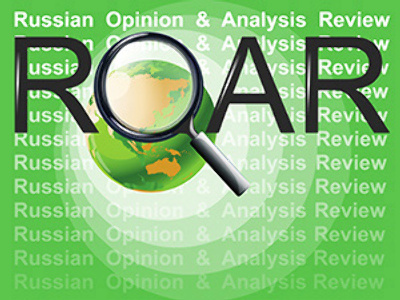 This Friday ROAR offers two views on the US–China currency war and a Russian MP’s opinion on a Russian agenda for the world. VREMYA NOVOSTEI reports that the struggle between China, trying to maintain the low rate of the Yuan against the US dollar to support its export sector, and the US, which tries in vain to make China raise the rate, is entering a new phase. The paper says the Yuan-dollar confrontation has become more intense under President Barack Obama. Now, a group of 40 Congressmen suggests nothing less than economic sanctions against China, a step once in the past already suggested by Congressmen and rejected by the administration. The paper quotes Chinese experts as saying that the unprecedented American pressure is aimed “not at helping China reform the mechanism of forming exchange rates or hoping for us to implement the change, but at making us raise the value of the Yuan, period.” The Yuan, released into a semi-free float in 2005, has gained 21% on its original value so far, says the paper, but the US congressmen suggesting the sanctions have calculated that it is still undervalued for 40%, which gives their export goods a great advantage over American and European competition. Since 2007 the EU has also been criticizing China for maintaining the low rate of its currency. In some European documents, says the paper, the Yuan was positioned as the main obstacle for fair trade and fair exchange rates existing in the modern world. However, China keeps at its game and frankly announces that it is going to continue doing it in pursuit of its own economic interests. The current US administration openly blames China for “manipulating with the exchange rate of its currency” but the paper quotes independent US experts who say that such statements may open Pandora’s Box and that in the long run good relations with China matter more than the disagreement about its financial policy. Indeed, says the paper, many experts think that with the definite rise of China’s economic influence in the world the role of the Yuan will be strengthening. The experiment that China is now conducting in Hong Kong, where 50% of payments in the import-export operations with the Mainland are now settled in Yuan, hints at the future role of the Yuan as a regional currency, on the way to becoming a regional reserve currency as well. IZVESTIA’s Anna Kaledina writes that if America adopts the suggested sanctions against China and China gives to that an adequate response, the currency war may lead to very serious consequences, including the collapse of the US dollar. However, she asks, will there be winners at all in that case? The situation is serious, writes the author. In the US, congressmen count millions of jobs that vanish from the face of America because of cheap Chinese imports. In China the economy is being re-oriented towards domestic consumption, so if exports drop as a result of US sanctions it will not prevent China from growing on and emerging from the global crisis as at least one of the strongest, if not the strongest, economies in the world. In Thursday’s issue of ROSSIYSKAYA GAZETA Chairman of the State Duma’s International Affairs commission Konstantin Kosachev writes that to be great a nation does not necessarily have to be big. It can be great because it is capable of setting agendas for the whole world. And a big nation which does not set agendas for the world should work its best to start doing it. The politician says that in the past years Russia has been more often reacting to agendas set by others than offer its own agendas. That is one of the reasons why Russia’s opinion was not taken into account by the Western partners as often as we would have liked: the Russian opinion came in the form of reaction, not initiative. Kosachev writes that in its time the Soviet Union definitely had set agendas for the world on a regular basis. Its influence on the collapse of the colonial system, and the fact that after WWII it led a whole group of nations under its banner, speak for themselves. In the past 20 years the US was successfully presenting its own agenda as the agenda for the whole world. Western Europe has been setting regional agendas, overcoming centuries-old contradictions and antagonisms between European nations. Post-Soviet Russia, due to various objective and subjective factors in its history, has been limiting its domestic and international agenda to the denial and countering of the global US agendas and the agendas set by Western Europe. At the moment the situation is changing, says the author. On the one hand, Russia is now usually listened to when it has something to say. On the other hand, we still often resort to reacting to others’ actions, and thus become prisoners of scenarios drawn by others. For instance, Russia’s relations with NATO at the moment are limited to two issues to which we respond in the reaction mode: the expansion (Georgia and Ukraine) and the placement of the elements of the US missile defense system. Both these scenarios are not ours, and there is no place for Russia in either of them. They are both reflections of interests alien to Russia, if not exactly opposite to them. But our country, continues the MP, not being a member of NATO, automatically becomes a risk for the alliance and, being a nuclear superpower, it definitely occupies one of the first positions on NATO’s list of potential adversaries. The only right way to respond to that, says Kosachev, is to offer our own models of interaction – in the case of NATO and in many other cases. It is senseless to blame NATO for pursuing its own interest. Instead, we should offer such models of interaction that would be beneficial for all, that would accept the existing international bodies and international legal mechanisms as they are, using them to block the trends that are against Russia’s interests, especially in the sphere of security. From that point of view, says Kosachev, the initiative by President Dmitry Medvedev on the new architecture of European security is Russia’s claim for setting a global agenda – not in the sense that others will have to obey us, but in the sense that the security architecture needs change, and Russia suggests it, ready to share the creation of the detailed version with our European partners, such as France and Germany.